KTM held a special news press conference on the first day of their home Grand Prix reviewing and analysing the effort behind their season and a half in all classes of MotoGP. 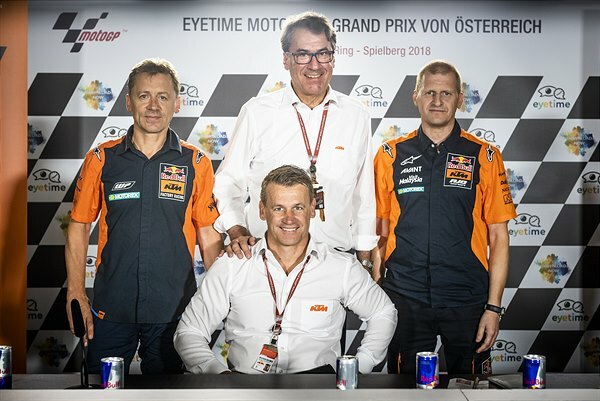 KTM Industries AG CEO, Stefan Pierer, was joined by KTM Motorsports Director Pit Beirer, Mike Leitner (Team Manager MotoGP), Aki Ajo (Ajo Motorsports) and Herve Poncharal (Tech3) for a one-off press conference at the Red Bull Ring in Austria for Red Bull KTM’s Home Grand Prix this weekend and the eleventh round of nineteen in the 2019 campaign. The duo talked about the strong efforts of both the Red Bull KTM crew as well as the hard-working test team to bring the KTM RC16 to regular top ten contention and a much reduced margin to race winners and other manufacturers compared to the factory’s debut season in 2017. Although both squads are feeling the sharp end of the sport with injuries to both Mika Kallio and Pol Espargaro, KTM have been able to spread their influence in the paddock as their ambitions for MotoGP keep apace. This weekend Bradley Smith will reap the full support of the KTM grandstand and fans and will hope to continue his positive speed and progress shown in both Germany and Czech Republic. Both talked extensively on the ‘doubling’ of their presence for 2019 with the acquisition of the Tech3 operation and the inclusion of Johann Zarco and Miguel Oliveira to join Espargaro and Hafizh Syahrin on the four RC16s. Kallio’s role has been essential for the RC16 test kilometres and the Finn will be joined by another tester for 2019 with decorated Grand Prix winner Dani Pedrosa’s name in the frame. There was praise for Aki Ajo’s set-up in Moto2 with Brad Binder making his breakthrough in 2018 and promising star Jorge Martin signed to fill Oliveira’s race boots as the class enters a major technical shift next season. The progress of Redox PruestelGP’s Marco Bezzecchi at the top of the Moto3 standings shows the capabilities of the KTM RC250 GP and with further development and attention directed towards the exciting category for ’19; where KTM were able to toast world championship success on their maiden attempt in 2012. Bezzecchi name was aligned with fellow Moto3 racer Philipp Oettl as both will make the step into Moto2 and with Herve Poncharal’s revised Red Bull KTM Moto2 unit. Last but not least the Red Bull MotoGP Rookies Cup, now twelve years in existence and providing MotoGP with the cream of young international prospect in that time, again forms an exciting and unmissable part of the Grand Prix programme. It is the first ‘rung on the ladder’ for KTM-supported athletes along the tough route to MotoGP. Red Bull Ring 2019 is Red Bull KTM’s second Home Grand Prix and it is one that the factory attempts as current leaders of the Moto3 and Moto2 series. In MotoGP the RC16 will be showing the strides made by the firm around one of the fastest tracks on the calendar.